This is a list of things that are NOT true about the breed. Folk lore and wives tales, that is all. 2. What makes them fall over would NOT help them in any way survive in the wild. 3. Tennessee Fainting Goats are NOT a color breed. They are like Nubians or Lamanchas and can come in any color, NOT just black and white. 4. When Tennessee Fainting Goats fall over they are NOT having a mini seizure or epileptic fit. 5. The genetic problem does NOT affect their life span or health when in captivity. 6. They did NOT originate in Texas. 7. They are NOT dairy goats. 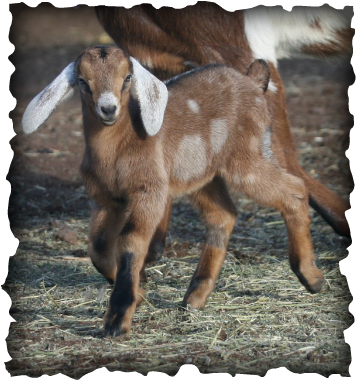 Myotonia is a disorder caused by a recessive gene that is responsible for the falling over stiff that we see in Tennessee Fainting Goats. What is going on here? It is like when someone hides behind a door or corner and then jumps out unexpectedly to scare you. Your body momentarily tenses and goes rigid. But, we are able to relax immediately. Myotonia keeps these goats from relaxing until about 20-40 seconds later. They often lose their balance and fall over due to this inability to relax. Of course, not all of the goats have such a problem; some can still hop away with very stiff legs. The goats will all relax slowly and be able to stand and walk stiffly shortly after but, some will recover sooner or later than others. Like with humans, we all have different reactions to different kinds of sickness and genetic problems. Where is the problem gene from? Originally? The first known about this breed was when a breeder named John Tinsley, in Tennessee, noticed that three of his does and one of his bucks ‘fainted’ when scared. He bred for this trait. When he moved, he ended up selling his goats to Dr. H. H. Mayberry. After some research, Mayberry found that these where the only of this ‘fainting’ breed in the world. So, they became very popular very fast. Why would anyone breed this genetic problem into their goats? Lots of people think that having their goats fall over when ever scared is hilarious and terribly cute. Therefore, Tennessee Fainting Goats make wonderful entertain and great pets. Plus, it is a little bit harder for them to escape confinement when they freeze in times of great emotion. They are unable to clime fences and to make a great get-away. On the commercial side of things, these goats were originally meat goats. Because of their mutation, they exercise their leg muscles a lot more than the normal meat goat, when fainting. When they tense up and relax slowly, their muscles’ contract. This means that their muscles are going to be better developed. They also grow very nice coats and although it is not as fine as Angora’s mohair, some people use them for their fiber. There are lots of people who think that they are almost the ideal goat. Entertainment and practicality all in one. Why am I presenting this? Why am I, a dairy goat person, giving a presentation about strange meat goats? 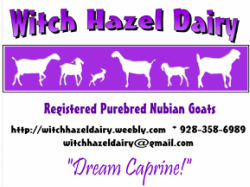 It really isn’t that farfetched, there are other genetic problems that are in dairy goats, such as G-6-S in Nubians. Having a wide range of knowledge, even if it is outside of your comfort zone is not a bad thing. I enjoyed learning about this and although I do not agree with all of the ideas that Tennessee Fainting Goat’s breeders have, I could now have an informed discussion, or debate, if I ever get into a situation where I would need to back up my ideas on the matter. Even if I don’t agree with breeding goats who have genetic problems, I am no longer as avidly against it like I was when I first took up this topic.